The most anticipated 2012 exhibit at Düsseldorf’s K20 Museum, named after Marcel Duchamp’s 1920 piece Fresh Widow, is showcase of surprising variety in works by famous 20th century artists with isolated window as main motif. Windows used in works by recent artists refuse to look into the world and express a new autonomy in the language of visual art. 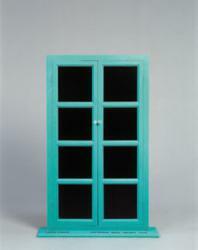 An isolated window is the main motif – and gateway into new freedom in painting – for many famous 20th century artists. A new exhibit at Düsseldorf’s K20 (March 31 – December 8, 2012) showcases the surprising variety of works in this genre by great names. Windows used in works by recent artists, including Ellsworth Kelly, Christo, and Gerhard Richter, are empty, dull, cracked, or simply refuse a look into the world, and in this way express a new autonomy in the language of visual art. Other artists featured include Eva Hesse, Robert Motherwell, Isa Genzken, Günther Förg, Jeff Wall, Sabine Hornig and Olafur Eliasson. For more information on the exhibit, visit http://www.kunstsammlung.de. Düsseldorf Marketing & Tourism GmbH is the visitors and convention bureau of the city of Düsseldorf. Its responsibilities include tourism and city marketing, as well as conference and meeting marketing, hotel reservation services, fairs and convention services, city event ticket sales and advance ticket reservations. For more information, visit http://www.visitduesseldorf.de. Düsseldorf International Airport, Germany’s third largest, offers several non-stop flights from US & Canadian cities (Atlanta, Chicago, Ft. Myers, Las Vegas, Los Angeles, Miami, New York, Newark, Toronto, San Francisco, Vancouver), as well as convenient connections to many European cities. For more information about the airport, visit http://www.fly2dus.com.